Directed by David Anspaugh (also known for the epic sports film "Hoosiers"), "Rudy" tells the story of one man's dream to play football for the Fighting Irish. It is an inspirational tale that reveals a universal truth that even if all the cards are stacked against you, your determination and hard work will pay off in the end. Such a powerful tale deserves an emotional musical score and Jerry Goldsmith did a wonderful job of capturing the energy of this movie with his music. 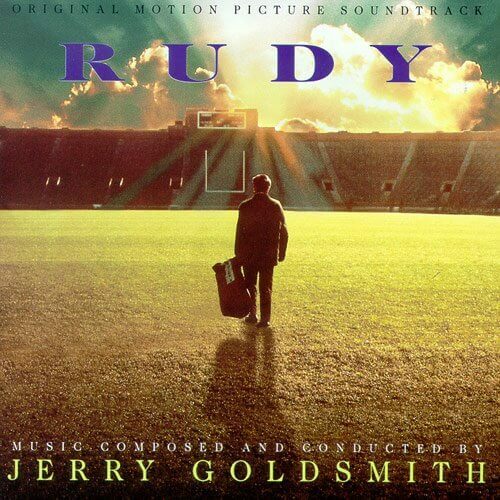 The Original Motion Picture Soundtrack for "Rudy" is one of my all time favorites. Ranked as one of the Top 25 sports movies of all time by ESPN, "Rudy" not only is a great story but a wonderfully produced movie and a lot of that has to do with the musical score. It is not often I bring up film scores but I feel like this one is too good not to mention. This is going to be part one of my "Cinematic Music Perfection" series of articles. I figured that there is no better song to begin with then the "Main Title" from Rudy.